Today has been awesome. I sat on the couch and caught up on TV shows all morning, went grocery shopping, did laundry, scoured the kitchen (and cut my finger on the food processor which wasn’t awesome), hung out with my friend Molly, and I still have an hour until I have to be at work. Mornings or days like this are rare for me. Usually when I work at night, I work out, babysit, run errands, or do something that keeps me out of the apartment all day. So when I get an odd day off? I veg and relax. SO nice. Plus when my dad was here last month, we set up the Apple TV that I had gotten about 3 years prior. Netflix AND hulu plus available on my TV is pretty damn awesome. It’s also nicer to catch up on TV on an actual TV instead of my 6-7 year old computer. So these cookies I made for book club. 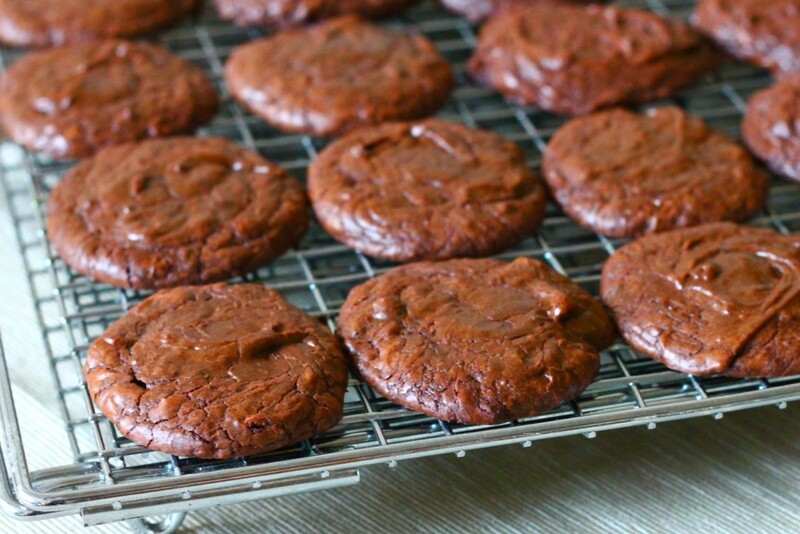 I wanted something chocolatey but I didn’t want to make a plain old chocolate cookie (which I still love). 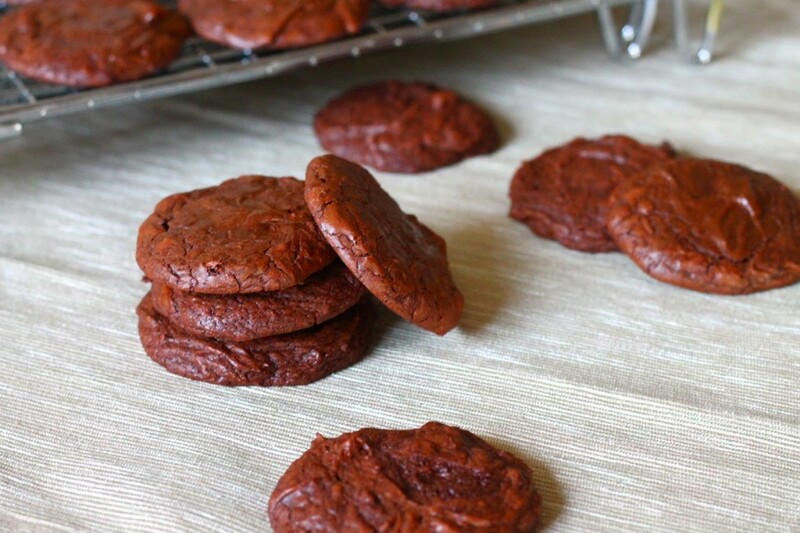 Browsing my pinterest page led me to rediscover a bunch of different brownie cookie recipes that I had pinned years ago. Minutes later I started making these bad boys and they were delicious. Fudgey and dense and one was almost enough (sacrilege, I know). Some notes about them though. It’s really important to let the eggs, vanilla and sugar beat for at least 8 minutes. I’m usually lazy and don’t listen to that (bad, I know) but it’s really important to here otherwise the batter won’t work correctly. It’s also important to use room temperature eggs. Now, I don’t usually plan in advance so a quick search on google showed me that if you put eggs in a bowl and cover with warm water, they’ll come to room temperature quickly. That was the first thing I did and by the time I needed to use the eggs for the recipe, they were perfect. 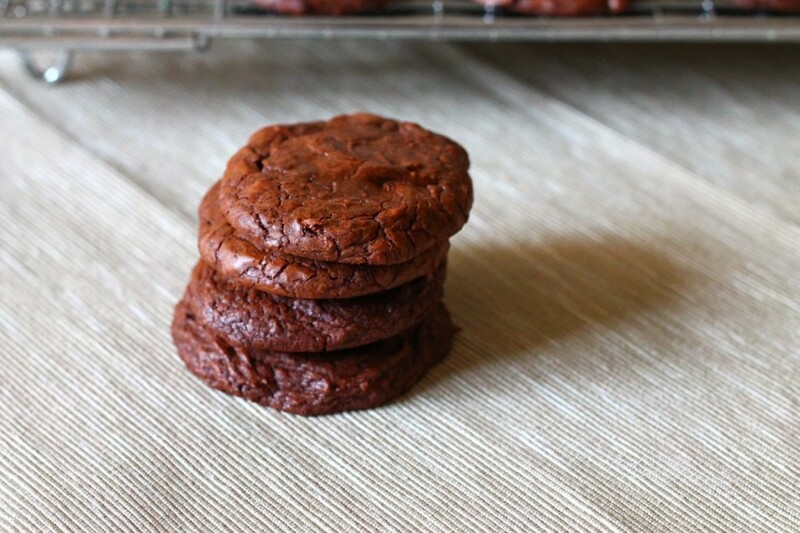 If you love brownies and cookies and want to combine the two, this recipe will be perfect for you! Preheat oven to 350 degrees F. Line baking sheets with parchment paper or silicone baking mat. In a medium sized bowl, whisk together flour, cocoa powder, baking powder, and salt. Set aside. In a double boiler OR a heat-proof bowl on top of a pot of barely simmering water (but not touching the water), combine chopped chocolate and butter. Stir until fully melted. Remove from heat and set aside. In a large mixing bowl or bowl of a stand mixer, beat eggs, sugar, and vanilla for about 8-10 minutes, until pale and creamy (and no longer yellow and foamy). Pour in melted chocolate and mix. Add dry ingredients and stir with a spatula until just incorporated. Using a large spoon or a tablespoon measure, spoon tablespoon sized cookie dough/batter onto baking sheets, about 2 inches apart. 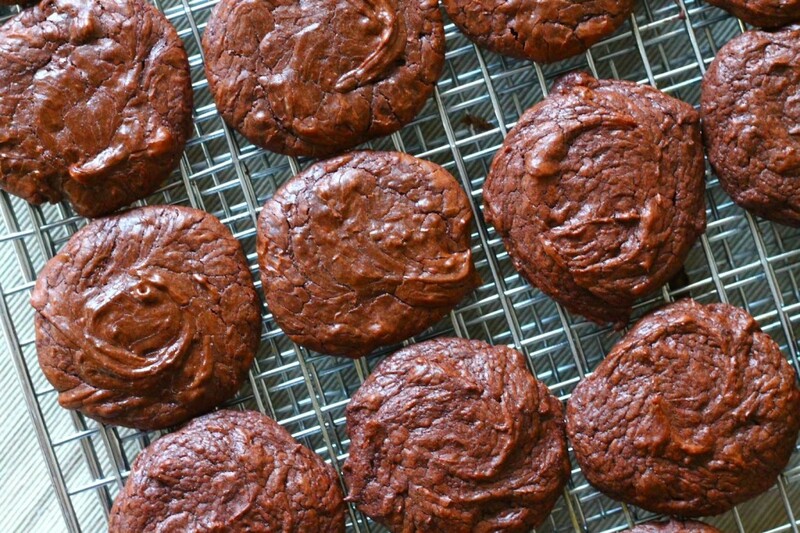 Bake for 6 to 8 minutes, or until the tops of shiny and cracked like a brownie. Let cool on sheets for 5 minutes and then transfer to a wire cooling rack and let cool completely.